Experts say these digestion-friendly foods are full of probiotics that can help supercharge your gut. You don't necessarily have to take a supplement to be good to your gut. Probiotics. It's one of the biggest buzzwords in the wellness industry, and the tiny micro-organisms living in our digestive tract have been touted as a natural remedy for a wide variety of ailments, from digestive issues and allergies to obesity and even depression. But what exactly do they do? Simply put, they're thought to support our health, says Jessica Marcus, M.S., a registered dietitian in Berkeley, California. Research is still developing in this field, but Marcus says that certain strains of probiotics, like saccharomyces boulardii, have been linked with sought-after health benefits, including improved digestion, a stronger immune system, and healthier skin. Initial studies also suggest that a lack of probiotics in the gut can result in various health problems, from gas and bloating to irritable bowel syndrome, acne, and eczema, Marcus says. Some studies have even tied an overabundance of certain "bad" bacteria to colon cancer. Which is why it's important to keep your gut flora, or microbiome, in balance. Marcus says it's constantly in flux, and is significantly impacted by diet, medications, stress levels, and other lifestyle factors. But the easiest way to a healthy gut is through food. Along with a diet that's rich in fruits and vegetables and low in added sugars, experts say these digestion-friendly foods can help supercharge your gut. 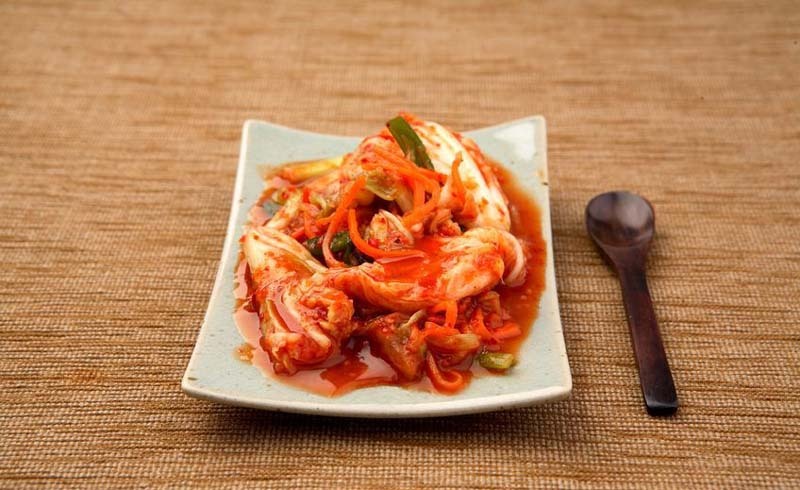 This classic Korean food is known for its fermented cabbage base, but other veggies — usually radishes and carrots — are often mixed in, says Jackie Newgent, R.D.N., author of The All-Natural Diabetes Cookbook. 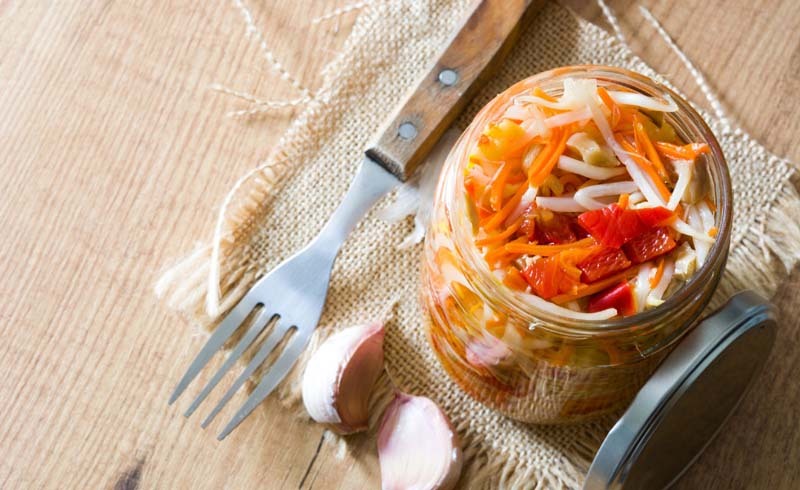 Research indicates that the food, which is typically fermented with probiotic lactic acid bacteria and seasoned with garlic, ginger, scallions, and red pepper powder, possesses anti-inflammatory, anti-bacterial, and anti-aging properties. Plus, Newgent says it's an awesome sandwich condiment, so you can skip the mayo and go straight for the flavorful stuff. This centuries-old beverage (which is made from apples that are crushed, distilled, and fermented) has been a popular health food for its ability to help lower blood pressure and promote a healthy weight. But not all apple cider vinegars are created equal. In order to make sure you’re getting probiotic benefits, Newgent says to pick one that's raw, unfiltered, and contains 'the mother,' which is the naturally-occurring cloudy matter — AKA strands of protein enzymes and probiotics — that are added during the fermentation process and could potentially boost your gut health. Her top pick: Bragg Organic Apple Cider Vinegar. Sometimes spelled as kephir, Marcus says this yogurt-like drink is made from fermented milk. Studies suggest it can support a healthy immune system by inhibiting the growth of harmful bacteria, like E. coli, while other research on the microbial composition of kefir has shown it could help lower cholesterol and potentially destroy certain cancer cells. Similar to kimchi, this popular hot dog and sausage condiment is another gut-friendly food thanks to its high amounts of the Lactobacillus bacteria, which is found in your intestines that can fight off certain viruses and prevent high blood pressure. This good bacteria may have the power to boost your mental health too, as research found it could help reduce social anxiety symptoms. “This is a fermented drink made from [black or green] tea, sugar, and yeast that provides gut-healing bacteria [and] inflammation-fighting antioxidants,” Marcus says. While there is limited research on this beverage, some of the health claims — like its ability to reduce the risk of heart disease and manage type 2 diabetes — may stem from the health benefits believed to come from the antioxidants found in black and green tea. (Most research has been done on rats though, so more testing needs to be done to see if the results translate to humans.) Keep in mind that some people have reportedly experienced adverse effects from this drink, including an upset stomach, since it's commonly brewed at home where contamination can occur. This any-time-of-day snack is packed with nutrients (including calcium, potassium, and vitamin B-12), and it also has two types of helpful bacteria: Lactobacillus and Streptococcus thermophilus. Not only do these bacterias work to improve bowel disorders and support colon health, but last year scientists discovered a potential link between Lactobacillus and a decrease in depression symptoms. (That said, the study was performed in mice, so there's no guarantee the same results will be seen in humans.) Newgent says to look for options that list "live active cultures" in the ingredients list and don't have added sugars. Even though the U.S. Food and Drug Administration (FDA) hasn't approved any health claims for probiotics, wellness professionals generally advise adults to consume 5-10 billion colony-forming units (CFU) each day. Since it can be difficult to calculate how many probiotics you’re ingesting at every meal (food manufactures aren't required to list the amount of probiotics on the food label), Marcus says taking a supplement in capsule, tablet, or powder form could be beneficial. She prefers MegaSporebiotic, a spore-based probiotic that's been clinically shown to reduce intestinal permeability, though it's best to talk to your doctor and find what works best for you.